Investment excellence requires a rigorous exploration into portfolio sources of risk and return via the consistent application of a disciplined, sustainable, and risk-aware investment process. 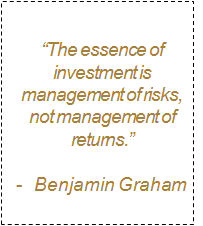 Rigorously explore sources of risk and return to provide foundation for achieving long-term objectives. Attain portfolio diversification benefits by analyzing factor exposures across investments. Maximize opportunities created by inefficiencies across asset classes and within capital structures. Identify dislocations created by the evolution of global economies and capital markets. Capture active management asset allocation benefits by applying a long-term perspective and managing short-term expectations.